Lesley discovers her gifts through planning. Person-Directed Planning is the process of setting goals, developing strategies and outlining tasks and schedules to accomplish the goals. It is a way of organizing around one person to support them in defining and creating a better future. It is a philosophy and an approach, not just a set of tools and techniques. Person-Directed Planning, also known as person-centred planning grew out of a commitment to inclusion as a social goal and was consciously designed as an inclusive process. Lesley’s Person-Directed Plan revealed that she is creative, spiritual, helpful and gentle. In particular, she loves music, cooking and dancing. 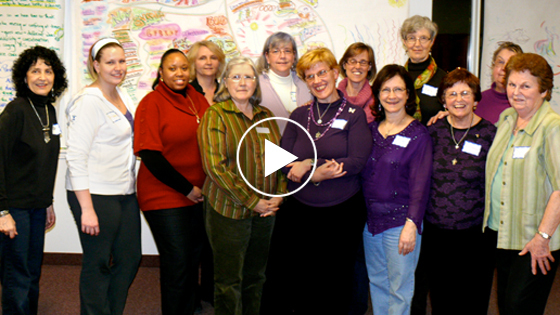 The process allowed Lesley to share her passions and interests with her planning group. Together they helped her develop new connections and opportunities, and supported Lesley to uncover ‘the life she was meant to live’. As Lesley comes into her own and discovers more of who she is aside from “Barbara’s daughter”, each new connection leads to a new opportunity for Lesley to contribute her gifts and become more deeply engaged in her community. Person-Directed Planning is a service that can be requested from Developmental Service Ontario (DSO). Alternatively, Passport recipients are able to utilize up to $ 2500 of their funding to purchase Person Directed Planning on a fee-for-service basis. To learn more about Person-Directed Planning and Independent Facilitation visit OIFN. The Ministry of Community and Social Services has developed Person-Directed Planning and Facilitation Guide, 2013 as a free download.